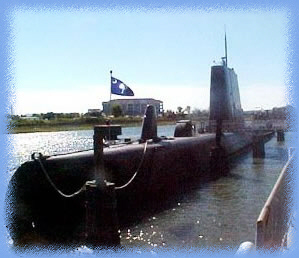 In early 1982, Joe Lunn and Hans Quade, knowing the USS CLAMAGORE (SS 343) had been acquired by the State of South Carolina to be part of the Patriot Point Museum at Mt. Pleasant/Charleston, decided it would be nice to have a reunion. Prior to this time gathering of former Clamagore Sailors had occurred in a few locations through out the south the largest being in New Orleans in 1979 with 9 sailors attending. Locating former sailors was going to be a tuff task however, they were eager to attack the job. 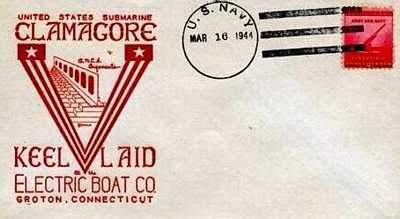 Ad’s were placed in Navy Times and All Hands Magazine, telling of the meeting/reunion set for Charleston, SC, one of the many homeport’s the USS Clamagore had been stationed. The first official meeting was scheduled for November 13, 1982. Slowly planning and details began coming together Joe and Hans having only memories and a small sailing list began to see their goal achieved. During the planning year they heard from more than 80 shipmates, Plank Owners, as well as Decommissioning Crewmembers. The 1st reunion was held aboard the USS Yorktown CV-10 in the Chiefs Petty Office Mess and was attended by: Joseph “Joe” Lunn, Hans Quade, Paul “hogan” Orstad, Gordon Voegelein, Troy Stevenson, Marshall Tarpley, Tommie Johnson, Ray Martens, Walter L. Nyland, John Geiger, Robert Fisher, Don Stieff, Joe Vining, Charles “Sam” Bass, Truman Pound, James E. Stelfox, Gil Borkenhagen, Joseph “Joe” Delduca, Albert Faranda, William “Bill” Linder, Darrel Mckinley, Clem Maddox, Charles "Buddha" Montgomery and George Bass and Andrews Maples. There were a total of twenty-four Clamagore shipmates who provided the motivation to move forward with the idea of forming an organization that would meet their needs for the future. Guess speaker, RADM HERMAN KOSSLER, CO of USS Cavalla, which sank a Japanese carrier Shokaku and three other vessels during WWII, highlighted the weekend. He gave a very informal talk on how Patriots Point was able to get the USS Clamagore, which had been out fitted and scheduled to go to Iran in the Philly Naval Shipyard. He stress the formation of a USS Clamagore Veterans Association, which would come to Charleston annually and help maintain our “ole home”. Out of this initial reunion meeting came the creating of the USS Clamagore Veterans Association. The following attendees were the first officers elected: President, Gordon Voegelein, Vice President, Troy Stevenson, Secretary, Tommie Johnson, and Treasurer, Hans Quade all living at that time in the Charleston area. 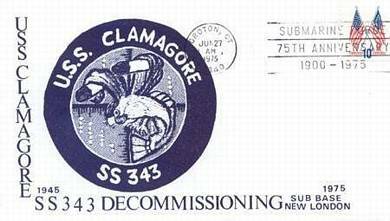 The first memorial service was held on board the USS Clamagore during the reunion aft of the sail with Mrs. John Dooling, wife of John Dooling CSC(SS) USN Ret. who died two years earlier along with Mrs. John L. Hofford, Wife O Cdr John Hofford, former XO who had also passed away toss in the first memorial wreath into the Charleston Harbor. The newly elected officers began working to secure an Associational Charter for The USS Clamagore Veterans Association from The State of South Carolina. The Clamagore Veterans Association was chartered. The Manager, Trustees, Directors were Gordon R. Voegelein, President, Troy Stevenson, Vice-President, Hans A. Quade, Treasurer and Tommy Johnson, Secretary. The association adopted By-laws as required by the Charter and a military nonprofit organization tax free status was obtained along with an establishment of an association bank account. The 2nd reunion was held in Charleston on October 12, 1983 with 27 members in attendance. No reunion were held due to lack of interest in 1984 and 85. Paul Orstad aka “hogan” was in Charleston on his company’s business in the summer of 1984 and suggested a reunion be held in New London, CT. President Gordon seeing it might have a chance to succeed gave the go ahead and with the help of Joe Lund and Hans Quade providing a sailing list, Hogan prepared reunion notices and placed them in as many military magazines as possible. Plans were made to hold the reunion #3 August 1986 at the Quality Inn in Groton. By-laws were amended and approved during this reunion. Paul “Hogan” Orstad was elected President, Bill Evans, Vice President, Charles “Sam” Bass Secretary and Hans Quade retained the Treasurer position. The 4th reunion was held in Charleston, SC the business meeting was held in the hanger of USS Yorktown a head count of 100 attending was recorded in the minutes.. Attendance and membership grew resulting in a strengthening of the association and successful reunions. Associational By-laws were updated establishing that reunions would be held in Charleston on the even years and else where in the odd years. Other movers and shakers in growth and development of the association were Jim Storms, Clem Maddox, Harold Montgomery, Hilton Pickett, George Bass, Jack Liptrap, Joe Delduca, Lewis Decell, Jimmy “Crash” Evans and many others yet to be named. Gradually more members were added, primarily due to the appointment of a Membership Committee, Chaired by Walter “Jack” Liptrap. 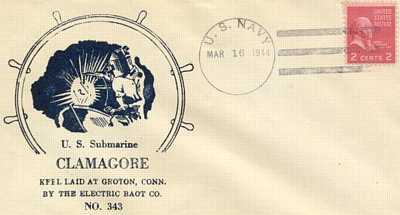 Jack, searching Naval Data records and the Internet located and made contact with Clamagore Sailors. Membership increased from just fewer than 200 in 1999, with 75 added in 2000 and another 103 in 2001. Membership has steadily grown and remains around 500 members in early 2005. In the late 80’s and throughout his remainder of his life, Jimmy “Crash” Evans created a newsletter that members looked forward to getting three time a year. Crash created, designed and served as Webmaster for his award winning USS Clamagore Web (SS343) site on the World Wide Web. He also provided these services for other boats on which he served. During the 2002 reunion the association authorized construction of a new web site, owned and operated by the association strictly dedicated to posting association news, reunion happenings, pictures, member listings, chaplain information, Eternal Patrol Memorial list. This site is currently operating and can be accessed via www.cvanews.org or www.ss343.org, approximately 247 association members have access to the world wide web.